Lack of time, eating out, holidays, stress? We all have challenges that can sidetrack our healthy eating plans. Here are some strategies to help your small changes stick. √ Short on time? Be prepared with nourishing grab ‘n’ go foods, like yogurt, nuts and fruit. Stock your kitchen with good-for-you snacks, like veggies, fruit, yogurt, cheese, hard-boiled eggs, seeds and whole grain crackers. Cook big batches of soup, stew or chili on weekends, then take a welcome cooking break on busy weekdays. Cook once. Eat twice. Make more food than you need for one meal and reinvent it for another. Shop for healthier convenience foods, such as frozen or pre-cut vegetables, plain frozen fish fillets, shredded cheese and canned lentils. √ Stressed? Bored? Sad? Eating for reasons other than hunger can lead to mindless munching. √ Need to get back on your healthy-eating track? A dietitian can help! √ Planning how you’ll manage healthy-eating roadblocks before they happen is key to success. 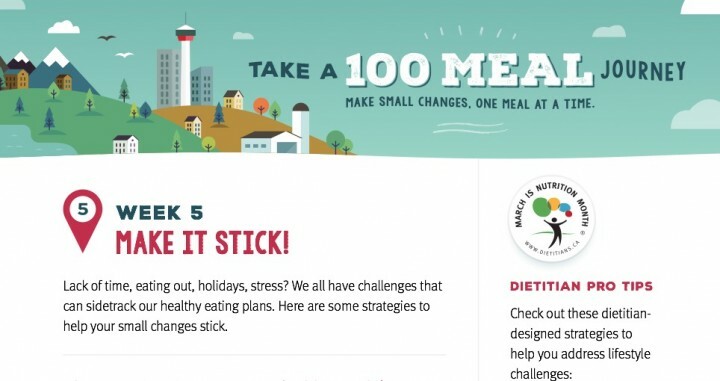 March is Nutrition Month: Take a 100 Meal Journey and improve your health one step at a time.